We are getting ready for Snowpocalyps over here, so I decided that I would try to work from home with Ina. Today will consist of me taking calls and answering emails in between dancing, singing, and chasing her from the stairs. Yay! Speaking of stairs - here is a little tip I thought of yesterday. I used to hate taking the stairs, but would do it every once in a while because I felt guilty about taking the elevator. Instead of dreading the stairs yesterday, I thought of every time I went up them as an opportunity for a mini-workout. Instead of trying to maintain my breath, I tried to get as out of breath as possible and max out my heart rate. When I walked down the hallway gasping for air I wasn’t embarrassed - I was happy to get in a 45 second workout. Do that 5 or 6 times in a day and you have yourself half a HIIT workout. I am hoping that taking the stairs will motivate me to get in a few other mini-workouts throughout the work week. Another tip - don’t stay up until midnight watching Veronica Mars - no matter how bad you want to find out what happens next. It will only lead to you scrounging the cabinet to find 1/4 bag of Doritos, a package of gushers, and 5 starbursts, which you will immediately eat. The next day you will be very tired because you stayed up so late. Just don’t do it. Go to bed at a decent time. Don’t eat 1 year old candy. Another tip - have a fruit / veggie snack ready for when you walk in the door. Lately Ina and I have been enjoying these green juice lemonades with spinach, cucumber, lemon, celery, ginger, and an apple, except for yesterday, and we all know what happened then. I think that is all I have for today. If you are in the snow I hope you are staying safe! 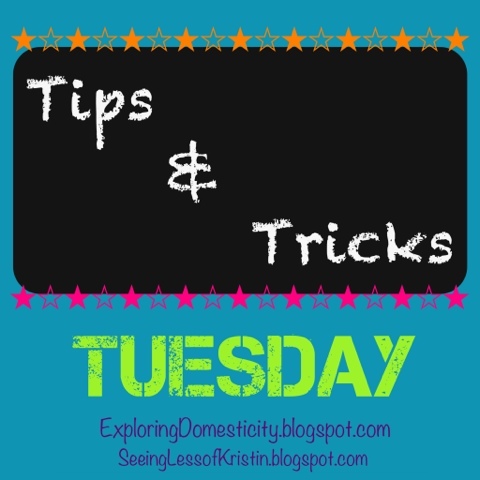 Linking up with Kristin at Exploring Domesticity! Yea! Great tips! I actually did nothing else but diet ad 6 flights of stair a couple times a day in undergrad and lost a good amount of weight. I didn't take the elevator at all and that was enough! It's no joke! I love your green lemonades - they sounds so good! Great tips - thanks for sharing! The party is up now - I'm in the middle of a dream vacation and no Internet, besides my phone! Thanks for the tips! I'm very jealous of the stairs you have access to. I'm in Lincoln, Nebraska and it is snowing...actually trying to think positive about it and tell myself it will be a good cross train workout to shovel some snow. Thanks for linking up with us today! Great tips!